It took a little while, but DirecTV has finally made good on its promise of an all-in-one portable satellite receiver, officially announcing its Sat-Go unit at CES. 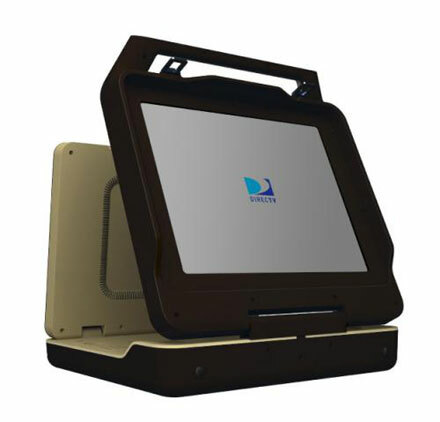 Intended for both indoor and outdoor use, the Sat-Go packs a 17-inch LCD monitor into its flip-and-fold design, along with an integrated flat antenna that DirecTV says will let you find line-of-sight with DirecTV satellites "within minutes." Also included is a rechargeable "laptop-style" battery, although the company isn't making any promises on battery life just yet (it'll also run off your vehicle's cigarette lighter with the included adapter, or plain old AC power). While DirecTV hasn't officially announced pricing details, The New York Times is reporting that that the Sat-Go will come in between $1,000 and $1,300 when it launches this spring. Current DirecTV customers will also be able to mirror their service to the Sat-Go for an additional $4.99 per month. The Times also got word from Sat-Go inventor Rick Rosner (who just happens to also be the creator of CHiPs) that DirecTV already has some additional models in the works, including the Sat-Go Pro, with a ruggedized design for use in emergency situations, and the Sat-Go Light, which will weigh in at less than half the Sat-Go's 25 pounds. Those curious about the Sat-Go's various states of foldedness can check out a couple more pics of it in action after the break. Read - New York Times, "Satellite Television in a Portable Box"